An elegant dessert rounds off a meal, making it seem complete and memorable, be it a special family dinner, a birthday, a festive occasion, or just a treat to pamper your loved ones. That said, desserts are becoming an expensive affair today—and quite commercialized too. Moreover, for vegetarians, it can sometimes be a wild goose chase to find a variety of scrumptious desserts while ensuring that they are really made without egg, gelatin or other animal produce. 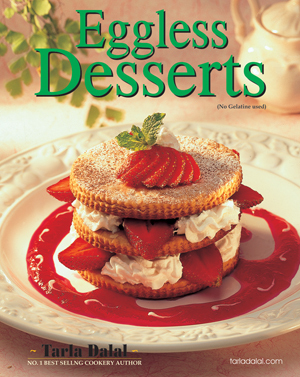 Keeping that in mind, here is a book on ‘Eggless Desserts’ that gives you a wide selection of mouth-watering desserts, which are not only eggless but also gelatin free. Every recipe is researched and tested in our kitchen to ensure that you will have no difficulty in making them. We have included 65 recipes under various categories like Quick Desserts, Cakes, Tarts, Pies and Crepes, not to forget a special section on Indian Desserts, which are innovative and simple to follow. It is vital to stick to the recommended ingredients, quantities and methods for basics such as cakes, dough and batters so that you get the best results. Indeed, with my favourite recipes and their techniques, you will not only learn to conjure up exotic desserts but also gain a great deal of experience on how ingredients behave under given conditions. You will find within the pages of this book many recipes for every occasion, ranging from simple to elaborate and sensational. Dip your heart and hands into recipes like Apple Jalebi, page 8, Ebony and Ivory, page 29, Fruity Chocolate Tarts, page 42, Grasshopper Pie, page 49, Crêpes Georgette, page 52, Strawberry Soufflé, page 70 , Bread and Butter Pudding, page78 , and more! Our last section covers how to make the basic recipes like sponges, sauces and pralines—and I am sure you will find this section quite educative. While we have given precise and detailed instructions, some desserts need a bit of practice to master—so try to make these whenever you find time so that you can get the knack of make them easier and faster. Some of these desserts will satisfy your artistic talents, while others are just right for busy mums with families to feed. While we have recommended garnishes for all the recipes, you can always set your brain ticking and come up with your own twists to each creation! Have fun with these recipes—doing something new can be both creative and rewarding, and you will be proud to present these delicacies at the dining table!